What Are the Laws in Texas on Filing a Personal Injury Lawsuit? A personal injury is defined as a situation in which one person sustains an injury because of the negligence of another party. The party that causes the injury can be a business, driver, friend, or family member. Any person who qualifies for a personal injury lawsuit can receive compensatory damages that can pay for medical bills, automobile repairs, and lost work wages. Additional damages recoverable under Texas law may include compensation for mental anguish, pain and suffering, and impairment. To qualify for a personal injury lawsuit in Texas, the injured person must be less than 50 percent responsible for the incident. 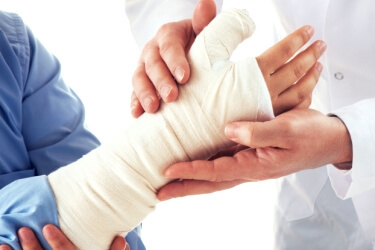 No person who is more than 50 percent responsible for his or her injury can recover personal injury compensation. The Texas courts will decrease the victim’s compensation by his or her level of fault, as well. For example, a $100,000 award will be reduced to $60,000 if the victim is 40 percent responsible for the incident. Such a rule applies to all personal injury cases in the state of Texas. Texas applies a statute of limitations on personal injuries. Personal injury victims have a two-year statute of limitations on them. Any person who tries to open a personal injury case after the statute of limitations has passed will most likely have his or her case dismissed from the courts. An attorney will develop a compensation figure by adding the injured party’s losses and presenting them to the responsible party. Recoverable amounts on mental anguish and pain and suffering vary depending on the severity of the injury and other facts of the case. Many different types of personal injuries exist. Some examples are medical malpractice injuries, automobile accidents, motorcycle crashes, slip and fall occurrences, railroad accidents, spinal injuries and more. Dog bites are also another popular personal injury. A personal injury lawyer will help investigate your case and determine the strengths and weaknesses. People who suffer from personal injuries sometimes do not realize that they are eligible for compensation. An experienced Texas attorney can handle an car accident insurance dispute and normally can tell a victim if he or she is eligible for compensation during an initial consultation. A compassionate attorney may be willing to offer assistance that temporarily relieves the financial burden for a victim. The best way to find out if one qualifies is to schedule an appointment with your Austin TX personal injury attorney as quickly as possible.